A look at the build-up in London ahead of the start of the 2012 Paralympics. 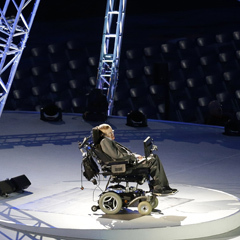 London - Britain's most famous living scientist Stephen Hawking on Wednesday launched the London Paralympics' opening ceremony, aimed at challenging perceptions of disability and championing the human spirit. Hawking, who has motor neurone disease and has spent most of his life in a wheelchair, began the curtain-raiser to 11 days of sport at an event involving over 3 000 performers, many of them with disabilities, after a fly-past by a disabled pilot. The author of "A Brief History of Time", described by organisers as "the most famous disabled person anywhere on the planet", guided a central character on a journey of discovery in a story inspired by William Shakespeare's "The Tempest". From the "Big Bang" theory on the creation of the universe about which Hawking has written extensively, to the 18th century "Enlightment" period and scientific discoveries of the modern era, Hawking urged people to take nothing for granted. "We live in a universe governed by rational laws that we can discover and understand," the 70-year-old theoretical physicist said through his voice-synthesised computer. The ceremony had been billed by organisers as a "celebration of the inspirational spirit of the Paralympic Games that challenges perceptions of human possibility". Margaret Maughan, Britain's first Paralympic gold medallist at the inaugural 1960 Games, was given the honour of lighting the cauldron, created by British designer Thomas Heatherwick and made of more than 200 petals. Now 84, she will receive the flame from British soldier Joe Townsend, who was to descend on a zip wire from the 115-metre (377-feet) high ArcelorMittal Orbit observation tower overlooking the stadium. Townsend, a Royal Marine commando, lost both legs when he stepped on a bomb in Afghanistan but is now an aspiring Paralympic triathlete hoping to compete in Rio de Janeiro in 2016 when the sport makes its debut. Queen Elizabeth II was to officially open the Games, watched by her grandson Prince William and his wife Catherine, 80,000 others in the Olympic Stadium and a television audience of millions around the world. From Thursday, a record 4 200 athletes, including an unprecedented number of women, from 165 countries will compete for 503 medals in 20 sports in front of a near-sell-out crowd for the first time in the Games' 52-year history. A total of 166 countries had been due to take part but the International Paralympic Committee on Wednesday confirmed that Malawi's team had not travelled to London to compete in what would have been the country's first Paralympics. Britain is considered the "spiritual home" of the Paralympics, as the first recognised sports event for athletes with disabilities was held in Stoke Mandeville, southern England, in 1948. The flame - created from four others kindled on the highest peaks of England, Scotland, Wales and Northern Ireland -- was brought to the venue in a 148km overnight relay from Stoke Mandeville to London. Shooting is set to provide the first gold of the Games on Thursday in the women's 10m standing air rifle. Medals are also up for grabs in the velodrome with the finals of the men and women's individual pursuit, in four weight categories in judo at the ExCeL Arena and at the Aquatics Centre, where 15 swimming finals are to be held. The showpiece athletics programme gets under way on Friday with the spotlight on South Africa's Oscar Pistorius, who is seeking to defend his T44 100m, 200m and 400m titles from Beijing four years ago. Pistorius, dubbed the "Blade Runner" because he runs on carbon fibre blades, made history this month by becoming the first double-amputee athlete to compete in the Olympics, when he made the 400m semi-final and 4x400m relay final. He has, however, played down expectations of repeating the treble.